Wait for this to hit the news. Just published at the Ministry of Social Development website, What Do Children Tell Us About Physical Punishment As A Risk Factor For Child Abuse? This paper discusses children’s views of family discipline and possible implications for policymakers. In 2004, 80 New Zealand children, between five and 14 years of age, took part in research eliciting their views on family discipline. It is a very small sample. The children were introduced to fictional characters who asked the questions. Splodge (a fictional alien from outer space) was introduced to the children (5–11 years) as being very curious about life on Earth. They were told that Splodge did not know much about life on Earth and wanted to know about lots of things. Splodge was especially interested to know about family discipline and thought that children would be the best people to ask. The children were asked if they could help Splodge by answering the questions in the Splodge storybook. Spike was introduced to the older children (12–14 years) as having just landed on earth from the planet Nostro to complete a homework assignment. The homework assignment was about what children on Earth think about family discipline. The older children were asked if they could assist Spike in completing the homework assignment by answering some questions. The questions Spike asked were the same as those asked by Splodge. Both presentations were adapted from the 1998 Willow and Hyder study. The focus group discussions were 60 minutes long on average. The discussions were audiotaped and later transcribed and analysed thematically. Hence,We have to be cautious in our interpretation of these findings of children’s explanations of concepts and events to a fictional character. These questions were asked about children in general, rather than their own individual experiences. On the other hand, the children’s verbatim responses indicate that they are generally talking about their own subjective experiences within their families. For instance, they were all asked, What are some of the things that happen to children when they do things they shouldn't? From the responses 61% said parents use physical punishment. Presumably 39% did not. But spontaneously only 10% of the 5-7 year-olds and 14% of the 9-11 year-olds said they were not smacked. Each child was not asked whether or not they were smacked. But these findings were considered significant enough to include. 84% lived with both parents. That is not representative, despite the research claiming socio-econimc and ethnic diversity. Further from the abstract, In response to questions on family discipline children spontaneously revealed concerning levels of the frequency and severity of physical punishment, some of which would be identified as child abuse using any threshold. Children’s reports of the context in which physical punishment was delivered by parents was also of concern. Many children reported high levels of confusion when trying to link their own views of physical punishment with the actions of their parents. So this unscientific piece of research will now be wheeled out in support of repealing section 59 because, The findings from this study indicate that children who live in homes where physical punishment is used are more at risk of child abuse than those that do not. It would have been most interesting to see the parental responses to this research. When David Fergusson researched partner violence he looked at each partner's individual reporting and then matched them for similarity of statements. That's what I would like to see happen here, though I'm not convinced wheeling out aliens to do the interviewing would be halpful . I used to think smokers were the new lepers. But I am fast beginning to believe it is Christians. Which bothers me deeply. Not least because a tolerance for people's religious belief is an essential principle the importance of which cannot be over-stated. The front page of today's DomPost features Martin Keast, Principal of Wainuiomata and Silverstream Christian schools. I have met Martin on a couple of occasions. He attended an education meeting I organised prior to the last election, and gave Rodney Hide a pretty good run for his money over the matter of vouchers as I recall. I hope I don't do him a disservice but I'd describe him as a Christian Libertarian. Certainly I found him a quietly spoken and thoughtful man. I can remember all of my headmasters, from Primary to Secondary. Respected figures each. Tyrants, no. One I still know today and put in the same vein as Martin, quiet and thoughtful. 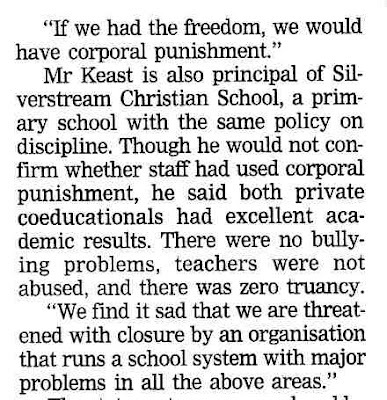 I was vaguely aware of corporal punishment but it didn't loom large because student's self-discipline was still of a degree that incidents were unusual. By sixth form I did know boys who were caned. If I'd worn trousers then I would have been with them. Instead they got the cane and I got put on report and suspended. But it was part and parcel of pushing the boundaries and accepting the consequences. Corporal punishment may seem like a big deal to people who live in fear of physical punishment but to many kids it was a price they were willing to pay when taking a risk. Well said, Martin. Well said. Yesterday Upper Hutt police embarked on a crime blitz. "If you have committed a crime, we are coming to get you. If you are planning to commit a crime, you are going to get arrested," says Acting Upper Hutt Area Commander Inspector Mike Hill. You talking to me? Are you talking to me ? This morning a 21 year-old man was stabbed to death right in the centre of town. No mention of an arrest yet. The US Supreme Court has upheld a ban on a certain abortion procedure which was previously legal where needed to protect the health of the woman. The ruling marked the first time that the court has upheld a ban on a specific abortion procedure. It also marked a departure from the Supreme Court's past practice of requiring a "health exception" in laws governing abortion to allow the procedure when a woman's health would otherwise be at risk. "Today's decision is alarming. It tolerates, indeed applauds, federal intervention to ban nationwide a procedure found necessary and proper in certain cases by the American College of Obstetricians and Gynecologists. . . . And, for the first time since Roe, the Court blesses a prohibition with no exception safeguarding a woman's health." The turnaround is highly significant because, The ruling buoyed abortion opponents who have placed their hopes in Bush's conservative nominees to the Supreme Court....The dramatic decision delivered to abortion opponents the promise of a more conservative court as reconstituted by Bush, who praised the majority's rejection of what he called an "abhorrent procedure" and suggested that he would continue working for greater restrictions on abortion. Some battles are never won. This is too awful. Testing whether people are fit to have custody of their children based on the amount they drink. Yuck. Wait a minute. Oh Dear Lord. The guilt. It's true. Yesterday I took the children to have lunch with Dad and had a glass of Framingham Sauvignon Blanc. Then...it's too shameful....I dozed off in the afternoon and was 5 minutes late getting Sam to soccer practice. See. Unfit. Useless parent. A million $ or more for 'partnership recognition'? CYFS staff members who belong to the PSA will be paid a bonus of $650. Last year CYF employed 2,670 full-time equivalents. I have no idea what percentage would be union members. If it's half or more the total payment, "taxpayers money" says National MP, Anne Tolley, would be pushing $1,000,000. What I can't get my head around is what the payment is for. "As the CYF/PSA partnership enters a new era following the merger with MSD, it has been agreed to recognise the success of the previous and ongoing partnership between CYF and the PSA through a one-off 'partnership recognition' payment of $650 gross (pro-rated for part-time staff)." As usual, if I can't find a satisfactory explanation for an action I start pondering what one could be. Anecdotally CYF staff have been told to get behind the Bradford Bill, and not sign petitions. Is this a sort of reward or compensation for those aggrieved by this instruction? Perhaps it's a sweetener for all the extra work CYF staff will be doing after the bill passes. Or are we simply seeing a cementing in of collectivism and Labour support? Whatever it is, it's pretty rich, in more ways than one. As an artist I always thought that, apart from complying with tax rules, I would escape the clutches of government regulation. Think again. The front page of the DomPost today reports about plans by Helen Clark, Minister of Arts and Culture and Judith Tizard to impose a 5 percent royalty on paintings resold within seventy years. I'm not going to argue the merits, or otherwise, of a royalty scheme. Some artists support it, some don't. Which is why some already write such a condition into a contract when they sell their work. But the meddling, interfering, we-know-best, it's-for-your-own-good, we'll tell-you-what-to-do twins come along and say, you will all do it. We will pass a law. And just quietly, when you think about it, if the govt can screw another 5 percent out of the purchaser that's another dollop of tax from the royalties earned. And, as if somebody wants to intentionally wind me up first thing on another day of the interminable school holidays, National spokesman for the Arts, Chris Finlayson doesn't know what he thinks!! What does he call himself? A Blue Liberal, Liberal Blue. Christ Chris. Being Liberal means promoting choice over government compulsion. No? This looks pretty impressive. According to news just released from Statistics New Zealand, Non-profit institutions employed 105,340 paid employees, and enlisted the help of over 436,500 volunteers. Pretty impressive until I made a comparison with Australia where, The estimated number of volunteers aged 18 years and over in 2000 was 4,395,600. And the Aussies are about on par with the United States where, About 61.2 million people volunteered through or for an organization at least once between September 2005 and September 2006, the Bureau of Labor Statistics of the U.S. Department of Labor reported. On the face of it Kiwis are not as generous with their time as first appears. More than half of the growth in inflows cannot be explained by demographic change and the New Zealand Superannuation age rise. It reflects, instead, an increase in inflow rates for people aged between 15 and 59. 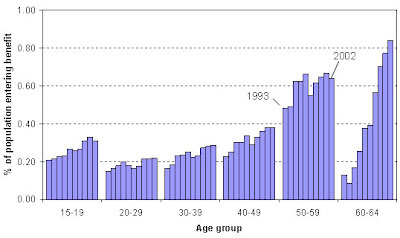 Figure 3 shows that inflow rates were higher in 2002 than in 1993 for all age groups within this band. So next time he uses this excuse know he is telling you less than half the story and when you hear him saying the growth rate is slowing know he is wrong. But I do try to keep an open mind so made time to belatedly read his paper. 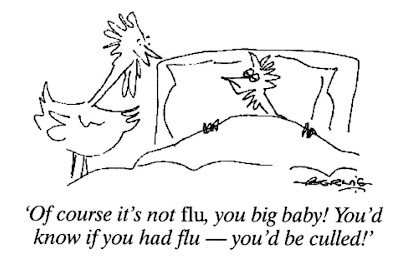 Unfortunately I wasn't that far into it when I came across something of an exaggeration. I agree with the thesis that the welfare state has contributed to crime but let's keep things in perspective. According to Peter Saunders (using information from Muriel Newman), Many of those who commit crimes are in receipt of welfare benefits — 4,600 of New Zealand’s 6,000 prison inmates in 2002 were on benefits before they got locked up. According to the 2003 Census of Prison Inmates 29.4 percent of prisoners had been on a benefit before incarceration. Perhaps 2002 was an aberration. According to the 2001 Census the figure was 38.6 percent. Both are a far cry from 76.6 percent. I think I know how the error has occurred. Probably the number going off benefits and into prison has been compared to the static prison population rather than all committals over the course of a year. But before I am criticised for nit-picking, my broader problem with Saunder's proposal (in the same vein as Roger Douglas') is the compulsion element. Also, better minds than mine (eg Roger Kerr) have argued against a Taxfree Income Threshold. I accept those arguments. Did anyone who attended the lecture have any thoughts? We may be interested in tracking recipients of welfare but the government is not. Working For Families assistance allowed a beneficiary working part-time to move onto an In Work payment as long as they were working, in the case of a single parent, at least 20 hours a week. "When clients exit benefit, Work and Income does not record whether a person went on to receive an In-Work payment. I am also advised that when a person applies for the In-Work Payment, Inland Revenue does not record whether the person has just left benefit." Next time you hear Benson-Pope congratulating himself and Work and Income about the DPB numbers going down you will just have to picture a question-mark in your mind - like I do. There seems to be a viewpoint not represented here. I thought there were eight parties in Parliament. Right now the state is paying people to produce the criminals of tomorrow. That is a fact. England and Wales have the highest imprisonment rate out of 15 European countries. New Zealand's is higher still. Until we deal with the first item on that list, people having children they cannot or will not care for, children who inevitably end up in fostercare or CYF homes, the whole problem of crime and over-stretched courts and prisons will continue to escalate.